Paracord is an excellent material not only as a useful piece of rope that is not bulky but also to create interesting objects and crafts, the strength of the cord and the available colors make the options endless. 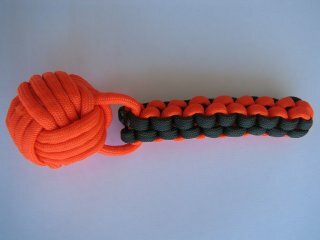 In this special feature article we will present some ideas, tips, links and examples about paracord objects. We will quickly show how to learn some of the most used knots to produce fobs, lanyards, belts, bracelets and other useful and nice looking objects. You can read the article following this link. The notesaf is a practical holder for your notepad, It can be used with regular notepad refills or with special write in the rain refills. The write in the rain refills are specially useful for edc since they will resist accidental spills, rain, humidity and other common accidents. The only drawback of the write in the rain refills is that the pages can get sticky after being for a long time in a pocket. It has a velcro closure snap and 3 front pockets, two small for pens or pencils and one larger that can carry cards or other small flat items, for example a card-sized multi-tool or a quick reference card for something. The material is very resistant this can ride in your pocket for years before showing any signs of degradation. A PDA without batteries :-). They cost just $8 and you can get them from this site. The Micra is not new but it mantains the appeal among many EDC tools, this is the smallest multi-tool from leatherman, when folded it can be easily carried in a keychain. The Micra unfolds to offer an excellent pair of spring tensioned scissors, probably the best scissors among small (and some larger) multi-tools. Then you have a bottle opener, large medium and small flat screwdrivers, tweezers, a nail file and cleaner, a ruler and a clip point small blade. The newer squirt models from Leatherman offer the same set of tools but allowing to use the small tools from the closed position, not a big deal for the Micra fans since they are used to opening and closing the tool in milliseconds. If you want a good pair of scissors and many useful tools with your EDC the Micra is a superb option and even if you don't want that a tool so small and practical can be a perfect backup multi-tool when you don't want to use a larger one. 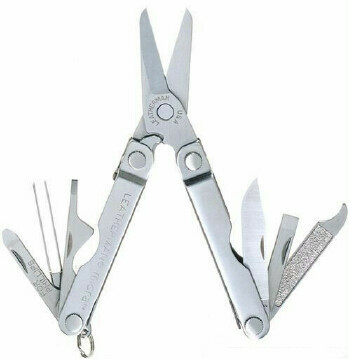 The retail price goes from $15 to $20, more information in Leatherman's website. The HDS is for many flashlight enthusiasts one of the best edc lights you can get. 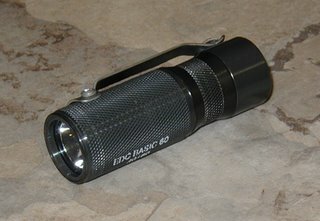 The "basic" model is a multiple brightness flashlight offering 4 different brightness settings, the ultimate adds several new modes and features to the basic 4 levels.Both lights are powered by a single C123 lithium cell with a 2 cell body available for longer runtimes. The switch is a tailcap clickie retruded to allow the light to stand and be used in "candle mode", press to turn on in primary mode, double click and you are in secondary mode (dimmer), click 3 times (or more) and keep the button pressed to access maximum brightness and click 3 times (or more) to reach the minimum brightness mode. From any mode keeping the button pressed you get momentary maximum brightness. A solid interface, easy to use and to remember. There are many quality details in the HDS lights, the lens, the HA-III body and fine knurling finish, the contacts inside, protection against overheating, protection against reverse battery, etc. The light accepts rechargeable batteries perfectly well and is regulated, that means the brightness is not affected by the battery status. The runtime is excellent depending on the brightness mode you use of course. A known "hack" allows to access the features form the "ultimate" model in the "basic" you just have to click 256 times (yay!) and you will be in the ultimate mode, you can program many settings in this menu. The ultimate model is the same as the basic but adds strobe, SOS, locator flash, and programable brightness levels among other nice features. The retail price is random to me so you can check for yourself in your favourite dealers. You can read more in HDS' website, for special prices you can check the sales in Lighthound. 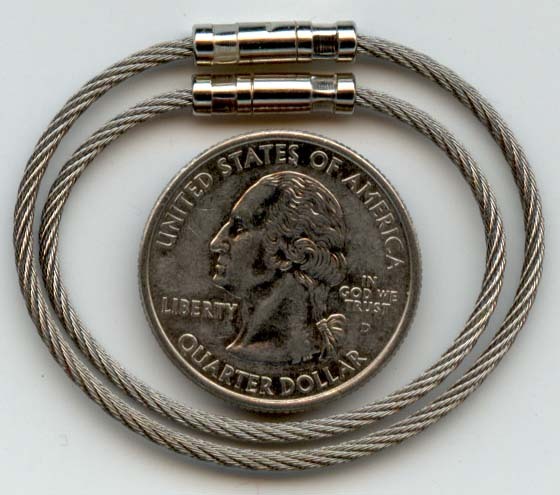 If you are interested in a titanium bezel you can check this product from the Sandwich Shoppe for $32. You may also change the pocket clip for a Titanium version for $25 but you have to bore new holes in your flashlight. If you want longer runtime you can add a 2 cell body for $50. 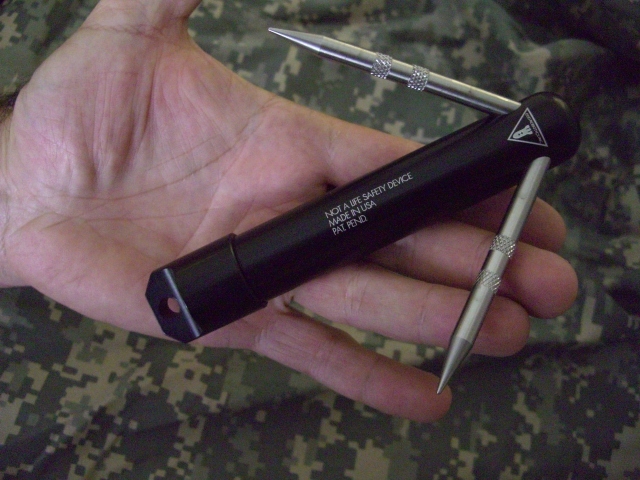 This is a pocketable hook that was designed by EOD robotics for the troops. It was conceived to be used in the field for things such as getting equipment, moving things to safe place, getting cables, backpacks etc. They should not be used for rescue or to try to hold a person. The device is hollow, the 3 protruding hooks can be unscrewed and stored inside the case for transportation; when in use you can put sand or dirt inside the case to add extra weight. Or maybe you prefer to use it as a survival capsule. A strange item indeed it's something that some people will never need and a neat solution for others it just depends on what kind of activities you do. You can get it from CountyComm for $75. Spy capsules are just small cilindrical aluminium containers that can be used to store different items like pills, tinder, a rolled bill, secret messages, flint, sugar, tabasco sauce, spare parts, screws, etc. These capsules are available in different colors : red, blue, green, black, purple and gold. They are constructed in aluminium and have an o-ring to make them waterproof. This particular model is 2 3/4" long and 5/8" in diameter. 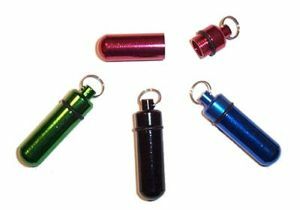 The capsules are a great adition to your keychain, you will probably find you will need more than one to store different items, one for medicine and one for small items for example. This version is slightly wider than other capsules sold at some retail stores so they can accomodate pills that you will have to break in other models. The capsules are not easy to find but don't worry since you can order them online from EDCdepot for $4, they also have a version with a small compass on the bottom for $4.50 and you can check for other sizes or versions of the capsule. Powerballs, powerballs what are powerballs? Basically they are powerfull gyroscopes that you can control to have fun and excercise your muscles at the same time. You start the powerball either using the provided string or with a quick flick of your thumb, you can roll it over a carpet too if you want, once started you can accelerate the rotor moving your wrist in circles, the faster the rotor goes the less your wrist will move and your muscles and tendons will be doing the real work. To keep it accelerating find the moment you have to flick your wrist to go against the rotor resistance, if you fail to do it the rotor will slow down and stop and you will have to start again. Depending on the direction of your movements and the position of your arm you can train different muscles, deltoids, bicepts, triceps, etc. Some of the models have a counter at the top that can perform several functions, like keeping track of your RPM record, or counting revolutions in the endurance mode where the total number of revolutions in 30, 60 or 90 seconds is what counts. The record mode keeps track of the fastest you were able to spin the powerball, if you are very good with it you can try for the world record and enter the leaderboard at the official site. 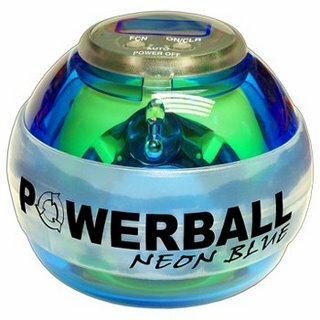 The Neon Pro version in the picture has leds that turn on as you spin the powerball, blue, green and orange versions are available. The counter is powered by a coin cell, the leds are powered by the rotor motion, no need for batteries. The powerball is really strong, you can really feel a burning sensation in your muscles after using it and if you keep a regular training program you will gain muscles (in a geeky way). The powerballs also help you reduce stress, and are great for starting conversations. The only problem with powerballs is that they are addictive as hell, if you have read this up to this point there is probably no way back, I'm sorry (insert evil laugh here). The neon pro model costs $48 and you can order and read a lot more about powerballs from the official website. You will find records, videos, user forums and many other nice features in the Powerballs website. A "twisty" is an interesting alternative to the eternal splitrings we see everywhere. The twisty rings are made of steel cable and can be opened or closed with a twisting mechanism, then the name. How to open or close them can be slightly embarrasing if you are not familiar, so here is a quick explanation that should do it: to open just twist the ring to form an eight figure, the ends will magically snap and open. To close it form the same figure snap the ends and let it return to its original shape, it will be closed. They take less space than splitrings and can be quickly opened or closed to remove items from a keychain in case of need. Some versions come with a plastic coating, others just the plain steel cable as in the picture. You can get them in 2 different sizes from $2.75 from Flashlightlens.com a nice wesbite that also sells UCL lenses and other accesories for flashlights. This baseball cap from Scottevest is not only nice but offers some interesting features for EDC carry. On the side of the hat there is a zippered pocket, and under the brim of the hat there is a small hidden pocket, why would you want pockets in your hat? I don't know but some mini-kits stored in the hat just in case of need might end up being useful at some point. For example you can store a small photon light, some cash and a swisstech utilikey or a card sized multi-tool. The hat is lined with coolmesh material to drive moisture away from your head, the outside is teflon-coated for water resistance and the interior sweatband is made of lamb skin which is very confortable. At the sides of the hat there are 2 small loops to keep your earbuds in place; finally at the top it has 2 ventilation eyelets. 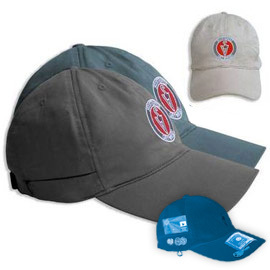 A great hat to carry some essential stuff and be confortable at the same time, the only detail is the big SeV log in the front, I think I would have preferred no logo at all for a more discrete look. You can get it for $20 in charcoal gray or hunter green from Scottevest's website.